D.C. Mayor Vincent Gray has vetoed a bill that would have required Walmart and other large retailers to pay their employees a "living wage" of at least $12.50 an hour. NBC4 sources say the council does not have the nine votes needed to override veto. News 4's Tom Sherwood reports on what's next now that D.C. Mayor Vincent Gray has vetoed the district's living wage bill that requires larger retailers to pay its workers more than the city's current minimum wage. Executives with several major retail chains, including Walmart, urged the mayor to veto the bill. Walmart even warned it wouldn't build three of the six stores it had planned for the district if the bill became law. The fight for the passage of the Walmart bill coincided with several living wage protests across the city. 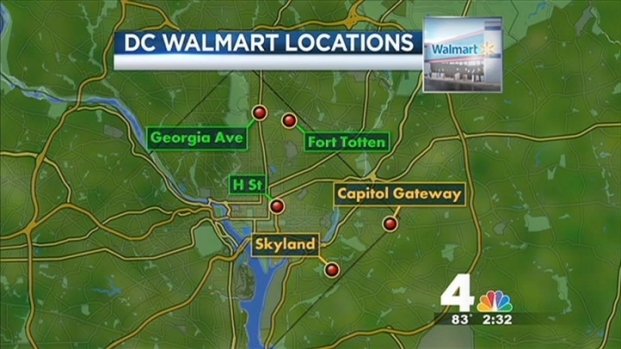 Just last week, several people were arrested while protesting at a Walmart in Hyattsville, Md. The protest was part of a series of protests nationwide demanding better wages and working conditions for employees at the retail giant.